An Archcore recreational steel building is designed to be both flexible and economical. We understand that recreational facilities like indoor baseball, covering a pool, or gymnasiums require features that can make traditional designs cost prohibitive. With clear-span widths up to 140' wide and heights up to 30', an Archcore recreational steel building can accommodate any of these applications while still meeting your budget. Pre-engineered recreational buildings can be built much more quickly than other types, reducing overall construction costs. They are completely pre-fabricated building kits and very easy to assemble. All you need for most models is some basic scaffolding and a rope to pull up the arch spans. A recreational metal building from Archcore is not only fully functional, saves you construction labor, but is very energy efficient and cost effective. 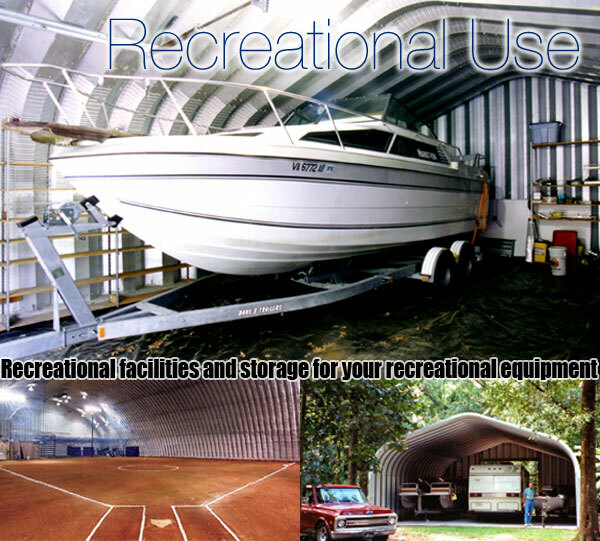 There are numerous recreational steel buildings being built by private owners, organizations and clubs for many uses. They are ideal for VFW meeting halls, hunting lodges, sports clubs or any activity where people meet. You can easily customize an Archcore building for any application whether for group functions or individuals. Archcore steel buildings are extremely durable. Our buildings are comprised of high tensile Galvalume steel developed and patented by the US Steel Mill Industry, and is engineered to withstand the harshest elements that Mother Nature has to offer. By simply bolting the panels together, the construction can be done by yourself, saving you thousands of dollars compared to other conventional type steel building designs. Pre-fabricated Archcore steel buildings are built to last, and we are a company who will be there for you, and support the product you purchased, should you need parts, extra length or customer service. That's what sets us apart from other manufacturers and makes us the best provider of quonset buildings in the industry.